'My next post will not be about cancer. It is time I wrote about something else. Before I sign off though I have some messages. To my friends and family who have recently lost someone to cancer, there are no words. Not everyone beats it and my heart goes out to you. Stay strong. Life is for living and you have to carry on. Your memories will never die but you are here and you have a life to lead. Please cherish every moment of it. Now I feel like a fraud. I need to write about cancer one more time. Three months after his wedding and 2 months before I got my all clear, my brother was diagnosed with oesophagal cancer. He was 31 years old. It had already spread to other organs. Until the moment he told me about his cancer I never understood what it meant to be heartbroken. Something changed for me forever that day. 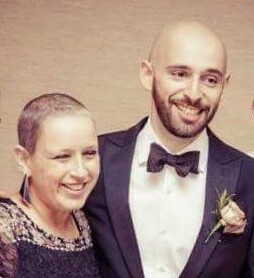 I knew what it was like to fight cancer and now my beloved newlywed brother, ten years my junior, was going to have to fight it too. The difference this time was that he was going to need a miracle. Being so far away, in another country, seemed to make it even harder. I wasn't going to be on hand to help. I wasn't going to be able to support him in person. My brother never asked for a prognosis. He only ever asked 'What do we do to fight it?'. He told only his closest friends about the cancer and he never gave them any indication of the danger he was in or what the future may hold for him. He didn't want pity. He didn't want to be treated like an ill person. He didn't want to live like he was dying. Two months later he flew to Israel to celebrate my son's barmitzvah with us and make some memories. Three months later and significantly weaker, he flew to Israel again. He took us to watch basketball which was his passion. We made some more memories. In the last week of May, before my own surgery, I went to spend a week with him in London. I wanted to spend time with him while I could and I didn't want to risk not being able to fly if I didn't recover quickly. He was positive about his treatment and about the future but when I left him, I was worried that I wouldn't see him again. Actually, I wasn't worried, I was terrified. Hugging his thinner frame and saying goodbye, while trying not to show how scared I was, was one of the most difficult things I have ever done. I am so grateful that I got the chance to spend that week with him. My parents came down from Manchester and we spent the Sunday all together making more memories. On Sunday July 17th, my beautiful strong and determined brother died. His family and friends spent over a week at the hospital with him, night and day. Despite the horrendous situation, he gave us the gift of making many beautiful memories together even in his last days. His friends from childhood, his teenage years, university and beyond came together to celebrate him and each other. He gave me the gift of catching up with his friends that I hadn't seen for many years. Kids that I met when they were 3, now grown and with families of their own. I met girlfriends and wives and children. I was given the gift of meeting friends that had not crossed with my own life but meant so much to my brother. Food, drink, comfort and friendship arrived in abundance daily. Accommodation was offered freely to my family and rides a plenty. Friends smuggled in the family's new puppy to meet him. We brought in Shabbat at his bedside and had dinner for 25 in a room nearby. In the week before he died, we helped each other come to terms with what was going to happen. For most, the shock was huge because he had hidden the extent of the illness from them to shield them. For others, they had only just found out he was ill at all! George had a huge capacity to love his friends and to keep friendships alive. The number of people that seemed to have been touched by his friendship is phenomenal. I estimated that there were close to 300 people at his funeral. Similar numbers of people came to comfort the mourners while we were all together. Even when I returned home to my community in Modi'in people contacted me who knew him and didn't realise we were siblings. I expected to find it difficult to watch my sister in law and my parents dealing with the loss. I knew I would find my own loss difficult but I didn't expect to be so touched by watching his friends dealing with their loss. Many of them don't remember a time before George. This had a profound effect on me because I realised that he was such an integral part of their lives, not just our lives. George meant so much to so many people. By now you have probably realised that those paragraphs at the end of my last post, were about my friends and family. A number of my friends and family had recently lost siblings, friends and cousins to cancer. The message about fighting cancer was directly to my brother. He knew it was for him. I promised to tell only my closest friends and only in his final days when he said he was happy for everyone to know, did I go 'public' about what was happening. Despite so many friendships he was a proud and private person. I felt like a fraud when I got the all clear because with my cancer being so public, people were constantly telling me how amazing it was that my cancer was gone and that my family must be so relieved. I just wanted to shout 'Actually no - my brother has cancer and I am worried that he will die!'. Almost six years ago we moved from England to Israel. I thought that taking our son away from my parents was the hardest thing I had ever done. We are all mobile and can travel but we all work and have restrictions on time and we just can't pop in for a cuppa anymore. Then I thought that telling my son that I had cancer was the hardest thing I had ever done. Next, I thought that telling my son that his beloved uncle had cancer was the hardest thing I had ever done. In reality, being so far away and having to work and deal with everyday life, while my brother was fighting his cancer was harder. It nearly broke me. I can't count the number of times I found myself shaking so hard I couldn't communicate or sat in a heap on the floor of the shower. I didn't do it in public. I didn't do it at work. I didn't allow it to break me because he wouldn't have approved. It wasn't his style. Don't mistake my coping mechanism for lack of feeling. Functionality doesn't always equal strength. Now we have started the grieving process. We are not together. We are separated by the sea and the air. This is something else that is going to be done with many miles between us. My sister in law is in London. My parents are in Manchester. We are here in Israel, so very far away. The separate grieving started during the shiva week when I sat for three nights in London and then flew home to finish the week. This separate grieving process will be familiar to so many but for us, it is new. This wasn't something we planned for when we emigrated. George loved his wife and his wife's family. George loved me and my husband. George loved his friends and relatives. I never thought that when I wrote the words, "Not everyone beats it and my heart goes out to you. Stay strong. Life is for living and you have to carry on. Your memories will never die but you are here and you have a life to lead. Please cherish every moment of it." that I would be writing them to myself. Maybe my words knew something that I didn't. George loved life. He understood that life is for living. Our lives will never be the same. My life will never be the same. I lost my sibling and I will miss him forever. It will hurt, forever. I remember the day that he was born and I remember the day that he died. I'm immensely proud of what he did in between and that he was my brother. He led a rich life and he would want his friends and family to do the same. Those of us that knew him can probably hear him now saying "I don't want to hear anything negative just go and enjoy yourselves!". So that is what I am going to do. Life is indeed for living. George is never going to be forgotten and he will be forever in my heart but life does go on. I may not understand why I am still here and he is not but that is no excuse not to live my life to the full. I will do it for me and for George. I knew George growing up but mainly from my first year at uni when we lived in the same flat. I remember when my parents dropped me off and I was so homesick and upset and scared about being away from home. George was so kind and offered me a cup of tea. It was such a nice gesture and I never forgot it. I was devastated when I heard the news. We hadn't spoken in years but he was someone I knew for a long time and he had such heart. I was sorry not to have been able to make the funeral. I wish you and your family a long life. Thank you Ruth. Were you in the Owens Park flat? I remember coming to visit him there when I was pregnant:) George like all good northerners clearly understood that you could not address a problem before a good cup of tea had been shared:) Thank you for sharing your memory. Hi. My name is Melissa Goldberg and I met George on an Aish trip to NYC. I remember he's face lighting up when he spoke about his nephew who I think I remember is called Jacob ( I may be wrong. It was a long time ago) I remember he bought he's nephew an NYPD top and he really adored him. He's nephew was only 1 or 2 at the time. My nephew was born not long after and I remember thinking I understand the love George feels now. His name is Judah and he's 13 now:) I think one of the teddies has that top! I got the first initial right! Wow 13. My eldest nephew is 12. I really am so truly sorry Catherine (see I remember your name) sending you lots of love and may you only know blessings from this moment on. You are in my thoughts. George was a character and made that trip to New York! What a lovely and touching post that was. So hard to write I am sure about your darling sibling who was taken too soon, despite his trying to live. What a person he was, and of course you are too... having a brush with Cancer as I did last year, really makes one thing of all the possibilities that could and sometimes are lost. I hope you and your family were comforted knowing how many lives your brother had touched and was loved by.. My deep sadness for your pain, but you are lucky in having had his love and all those blessed memories you made in the last weeks together.. lovely post that I think he would have really appreciated. and I am sure your parents loved the post too... all the very best from the old UK and I hope your journey and your families, gets a little easier from now on..